We have two itineraries to choose from on our Lyme Regis to Poole holidays - you can choose from 6 or 7 days walking. This is our shortest itinerary covering Lyme Regis to Poole. Walking the whole route over 6 walking days, this itinerary is more challenging. The average daily mileage on this holiday is 14 miles and there are two days where you will walk 15 miles. The first day walking has some steep ascents and descents as you make your way along the coast to West Bay. There are a few diversions to take you around areas of landslip. The landslides often release fossils from the ground, leading to the Jurassic Coast being designated England’s first Natural World Heritage Site. After leaving Lyme Regis seafront you go uphill and there are great views of the Black Ven landslip. Passing over Fern Hill you then descend to Charmouth Beach, you can look out for fossils on the beach. The path now has more ups and downs before the steep climb to Golden Cap. Along the way you will pass close to the ruins of the 13th century St. Gabriel’s chapel. Golden Cap is the highest point on the South Coast of England (191m) and the views along the coast are stunning. From Golden Cap it is downhill to Seatown before climbing again to Doghouse Hill the site of Dorset’s oldest human settlement. The path continues along the cliffs to reach Thorncombe Beacon, one of a chain of beacons used to warn of the approaching Spanish Armada in 1588. From here there are a few more undulations before reaching West Bay. There are a few short steep ups and downs at the start of this section followed by flatter walking by Cogden Beach and Chesil Beach. The path passes through West Bexington Nature Reserve, a stop off for migrating birds and home to many others. The long pebble bay of Chesil Beach was the site of many shipwrecks, particularly sailing ships, blown onto the beach by the prevailing wind. There is a climb to reach the charming village of Abbotsbury, opening up views along the beach and passing near to Abbotsbury Swannery. The Swannery was established by Benedictine Monks in the 11th century and is now a sanctuary for a colony of Mute Swans. Today the walking is easier. Leaving Abbotsbury you cross fields and low hills with open countryside views, before the path meets the Fleet Lagoon. Lying between Chesil Beach and the mainland coast of Dorset, The Fleet is tidal, creating an environment rich in wildlife both above and below the water. You walk by the Fleet to Ferrybridge where it links to Portland Harbour and the sea. The path from Portland Harbour follows a disused railway line for a short distance, passing the ruined remains of Sandsfoot Castle, one of Henry VIII’s coastal castles, before continuing into Weymouth. You start today with a flat walk along Weymouth seafront and then begin to climb. 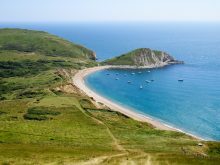 Your walk takes you through fields along the cliff tops, with many shorter undulations, through a few coastal villages and pretty Ringstead Bay. From Ringstead there is a long climb, passing St. Catherine’s wooden chapel to Burning Cliff and White Nothe with fantastic views along the coast. The path now has many steep ups and downs as you walk along the clifftops to Lulworth. 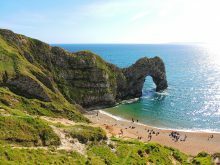 This is a very fine stretch of coastline, passing Durdle Door and St. Oswald’s Bay, be sure to take a look back along the cliffs at the route you have walked before descending to Lulworth. There is a military firing range on almost the whole path between Lulworth and Kimmeridge. The range is most likely to be open at the weekend or on a public holiday. When the range is closed you will need to follow the inland alternative route. There is a diversion for cliff fall at the start of the path through the range -you can cross Lulworth Cove to re-join the path on the other side of the bay except at high tide when some road walking is required. The route is then along the cliff tops with steep climbs, rusting military machinery and Flowers Barrow, the site of both an iron-age hill fort and WWII gun emplacement. When the range is closed the alternative route passes through woodland and country estates. There is more wildlife around this path than along the coast, it is a scenic walk following a longer but less undulating route. From Kimmeridge Bay you pass Clavell Tower, a distinctive folly built in the 1830’s and moved back from the cliff edge when it was in danger of falling into the sea. There is one more long steep ascent up Houns Tout cliff before leaving the path for quaint village of Worth Matravers. From Worth Matravers your walk continues along Emmett’s Hill with a steep section both down and up to reach St. Aldhelm’s Head where there is a small 12th century stone chapel. The route continues more gently up and down through fields and an old quarry. As you near Swanage you will pass Anvil Point lighthouse and Durlston Nature Reserve. The seaside town of Swanage has a long sandy bay and Victorian pier. It is also home to the Wellington Clock Tower, one of several monuments, large and small, moved here from London by George Burt, a former Swanage resident who moved to London in the 19thcentury but retained his interest in his birthplace. After a flat amble along the seafront at Swanage the path climbs over Studland Hill, your final climb before descending to Old Harry Rocks, and down again to Studland Bay and South Haven sands. The walk over the sands to South Haven point is flat but quite hard going for around 2.5 miles. The statue marking the end of the South West Coast Path is shortly before the ferry landing at South Haven Point. From South Haven Point you will use the ferry and/or bus to travel to Poole. Travel from South Haven to Poole. To reach your final destination of Poole, cross to Sandbanks using the regular ferry service from South Haven Point, this ferry runs 3 times an hour. You can then take the pleasant Brownsea Island ferry service from Sandbanks to Poole Harbour via Brownsea Island. The last ferry runs at 4.30pm. The Breezer 60 bus also runs from Sandbanks to Poole. General Travel information for the South West Coastal path area will be in your holiday pack including train and bus timetables where available. By Air: If travelling from overseas the main airport to fly to is London Heathrow. To travel from the airport to London Waterloo station takes around 1.25 hours. From London Waterloo train station you can travel by train to Axminster, it may be possible to travel from Heathrow airport to other stations on the Waterloo/Axminster line at Richmond or Feltham depending on the timing of your journey. Buses X51 and X53 travel between Axminster and Lyme Regis, there is also a taxi rank at Axminster station if preferred. The journey from London Waterloo Station to Lyme Regis takes approx. 3.5 hours. If you prefer to fly to Bristol Airport the journey to Lyme Regis takes approx. 3.5 hours using buses, or by bus and train. By Public Transport: The nearest mainline railway station to Lyme Regis is at Axminster. Axminster railway station is located on the West of England Mainline. Buses X51 and X53 travel between Axminster and Lyme Regis, there is also a taxi rank at Axminster station if preferred. The journey from London Waterloo Station to Lyme Regis takes approx. 3.5 hours. By Road: Lyme Regis is located just off the A35 between Honiton and Charmouth. Travelling from the East you would leave the M3 at Junction 8 then follow the A303, A358 and A35 before finishing your journey on the B3165 into Lyme Regis. If travelling from the North on the M5 you would leave the motorway at Junction 25 then follow the A358, and A35, finishing your journey on the B3165 into Lyme Regis. By Public Transport: There is a railway station at Poole with direct trains to London Waterloo. If travelling to Bristol airport you would take the train from Poole to Southampton Central and change for Bristol Temple Meads, then take the bus to the airport. By Road: Leave Poole on the A350 towards Ringwood/Dorchester. If travelling East or North, after approx. 1 mile take the A349 which does have a few turns to look out for and then joins the A341. After approx. 4.5 miles take the A31 towards Ringwood, this will become the M27 which will take you to join the M3. If travelling West follow the A350 for a further 0.5 miles after leaving Poole, then take the A35 towards Dorchester. At Axminster follow the A358 to join the M5 at junction 25, Taunton. A rest day in Lyme Regis is a must as the scenery is breath-taking in any weather. Its historic Cobb and harbour are iconic to the area. Lyme Regis is home to a number of historical landmarks and education attractions. If you have the time to add a rest day on your holiday Lyme Regis is a great spot to explore! Weymouth is an ideal destination to visit on a rest day. It’s fine Georgian promenade is an inspiring setting to the long arc of fine, golden sands. A gateway to the UNESCO World Heritage Site the Jurassic Coast offers spectacular views, stretching across the horizon. If that’s not enough, it’s just a short distance to the Isle of Portland which offers a whole range of activities and attractions to people of all ages. Portland Castle offers a historic adventure as well as great views over the horizon. There are also some lovely nature reserves. Not only is it a beautiful spot to visit, Weymouth offers many outdoor activities, made possible by its setting. Poole is an active tourist resort in the east of Dorset, known as Europe’s largest natural harbour. It has award winning blue flag beaches including the world-famous Sandbanks Beach, a lively quayside and a stunning historic old town. Poole’s waterfront is a paradise for sailors, wildlife and water sports. With Poole’s natural coastal setting you are sure to find plenty of superb beachside cafes, restaurants, pubs and bars making it a great place to relax.